CARACAS, Mar 6 2013 (IPS) - Part of the legacy left by Venezuelan President Hugo Chávez, who died Tuesday, was his determined struggle for the integration of Latin America independent of the standards and models of the industrialised North, and for the reinvigoration of left-wing radicalism in Latin America and the Caribbean. Chávez forged ahead in the field left open by the end of the Cold War, using as a tool the oil and financial resources that he employed in an almost discretionary manner in Venezuela, and with a charisma and gift for communication not seen in a leftist leader since Cuba’s Fidel Castro. “When it seemed that Castro’s leadership abilities would not be seen again, Chávez showed up to display a new manifestation of the radical left and encourage that tendency throughout the region,” Carlos Romero, director of graduate studies in political science at the Central and Simón Bolívar universities in Caracas, told IPS. Elected and re-elected several times as president of Venezuela since 1998, Chávez “felt called upon by destiny to follow the path of (independence hero) Simón Bolívar and be a kind of revolutionary leader in the world against the empire, the United States – something more rhetorical than practical,” Demetrio Boersner, who taught diplomacy and political science to several generations in Venezuela, told IPS. His election preceded that of Evo Morales in Bolivia, Rafael Correa in Ecuador and Daniel Ortega in Nicaragua, whose countries are partners of Venezuela, Cuba and several Caribbean island nations in the Bolivarian Alliance for the Peoples of Our America (ALBA). He was also in power before the current and former left-leaning governments of Venezuela’s allies in the Southern Common Market (MERCOSUR), an integration scheme in which Argentina, Brazil, Paraguay and Uruguay were joined by Venezuela after Chávez pulled the country out of the Andean Community, made up of Bolivia, Colombia, Ecuador and Peru. 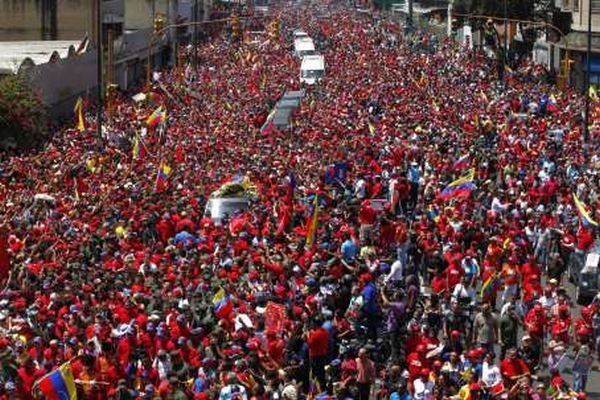 In the international arena, Chávez “leaves several big assets, like the projection of his political approach not only in the region but also reaching out to distant countries, encouraging other actors, like Russia and China, to get more involved in this region,” Romero said. “Another was the integration, with ideas that were not necessarily correct but were novel, based on more authentic models than those promoted by the West,” he said. Besides founding ALBA, Chávez played a key role in the creation of the recently established South American Community of Nations (UNASUR) and Community of Latin American and Caribbean State (CELAC), and of the regional Latin American TV network Telesur, the Banco del Sur (Bank of the South), and an incipient regional currency, the sucre, to facilitate intra-regional trade without the need for euros or dollars. A third asset was “the use of oil as a key instrument of cooperation, as Petrocaribe used it, to balance the national accounts and boost the energy capacity of many countries in the region,” Romero said. Petrocaribe supplies 18 countries in the region with Venezuelan oil on easy payment terms,” and should be maintained and improved as a cooperation scheme,” Boersner said. By doing so, “Chávez became the heir to the ideas of Soviet-type bureaucratic collectivism, whose failure was demonstrated by the fall of the Berlin Wall, but which survived in Cuba, precisely under his mentor and inspiration, Fidel Castro,” Boersner said. Chávez was always able to back up his integrationist or redemptive message with funds, whether they went to health or literacy programmes, refineries in Brazil, Nicaragua or Ecuador, fuel for poor neighbourhoods in the United States, military cooperation, food purchases or loans to businesses far outside of Venezuela’s borders. Romero believes it is still too early to say who will pick up the baton as a new reference point for Latin America’s left, while Boersner says there are still “two lefts” in the region. “One would fit with social democracy, with a capitalist economy but with a social redistribution of income, as in the case of Brazil and Uruguay, and the other was represented by Chávez, the heir to the bureaucratic collectivism that failed,” said Boersner. The image or even silhouette of Chávez, who was prone to hours-long, vigorous speeches in favour of the poor and against imperialism and the elites, are increasingly visible all over, on posters, t-shirts and on-line social networks, as symbols of the Latin American left.